Jaden Martin (21) and Amos Anderson (12) were part of a tight Oceanside defense. Cooper Wirkala (11) found enough open spaces to collect thirty points. (Rockland ME) It wasn’t raining outside but it sure was inside. 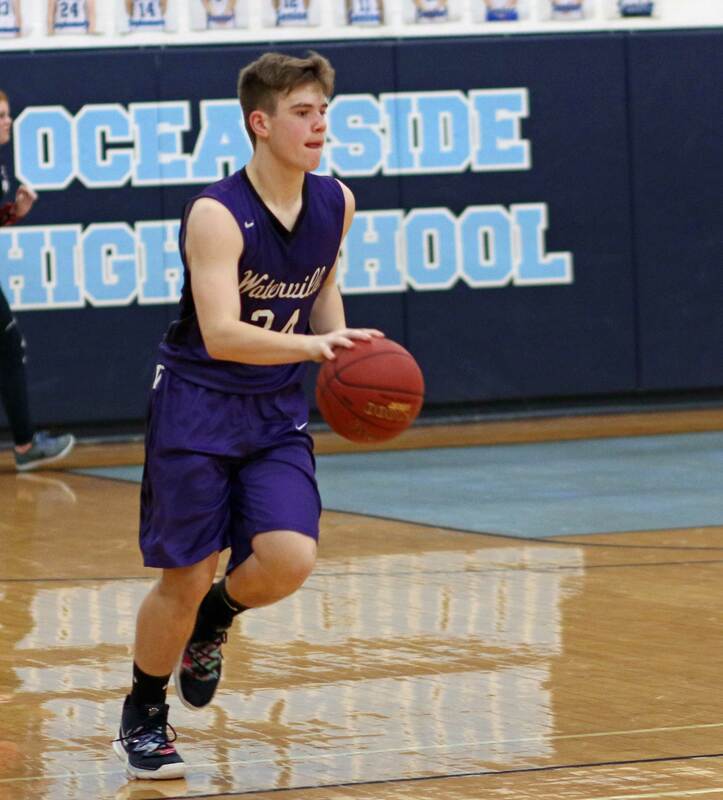 Raining three’s, that is, as Oceanside poured fifteen of them on Waterville in a 73-47 dousing on Friday night. The Mariners (11-4) nailed ten of those triples (on sixteen attempts) in the first half and raced away, 42-20. The five long ones added in the second half were pure gravy. Cooper Wirkala registered a double/double for the home team scoring thirty points and taking in ten rebounds. 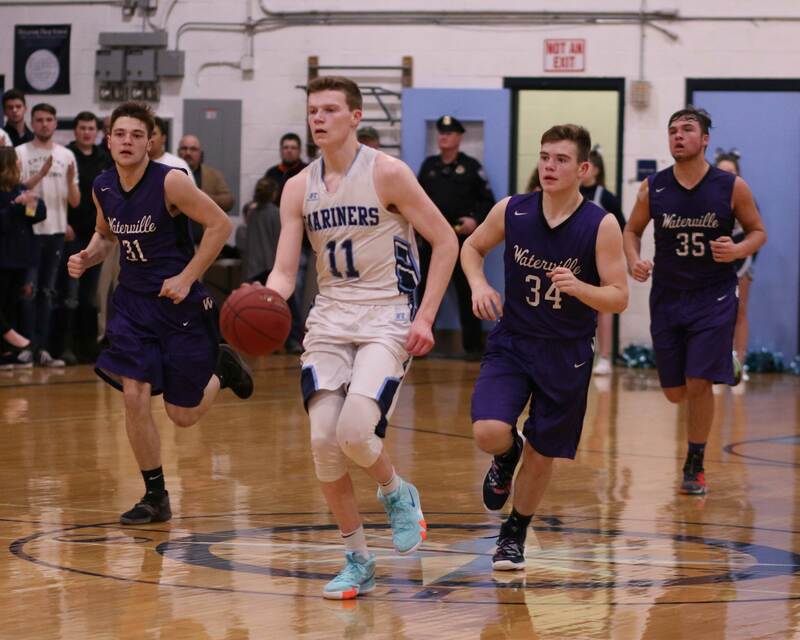 Waterville (2-12) tried a zone defense against Oceanside. It didn’t work. The Mariners patience on the perimeter turned up open 3-pointers all night long and on this evening, they hit half of their thirty attempts. “We did a good job of moving the ball,” explained Cooper Wirkala afterward. “We really hit our shots tonight.” Cooper struck five times from deep. On this night, the perimeter shots never ran dry. 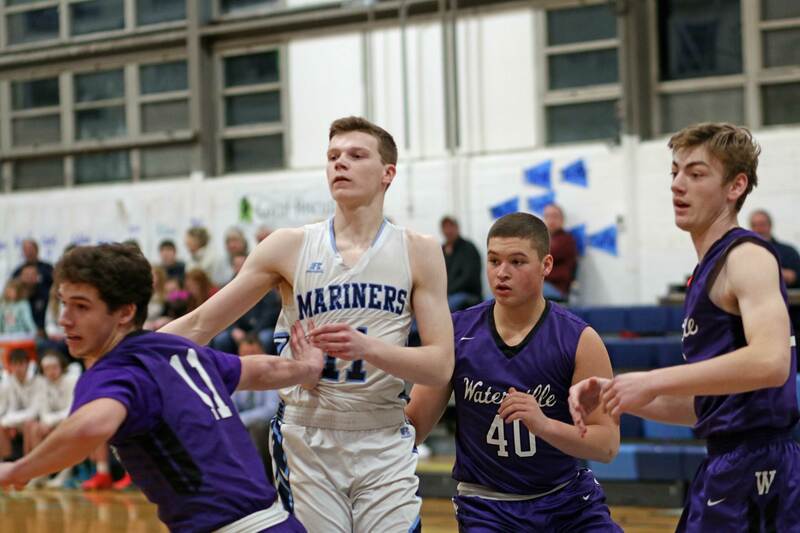 Waterville never had a chance, as a result, to challenge the Mariners. 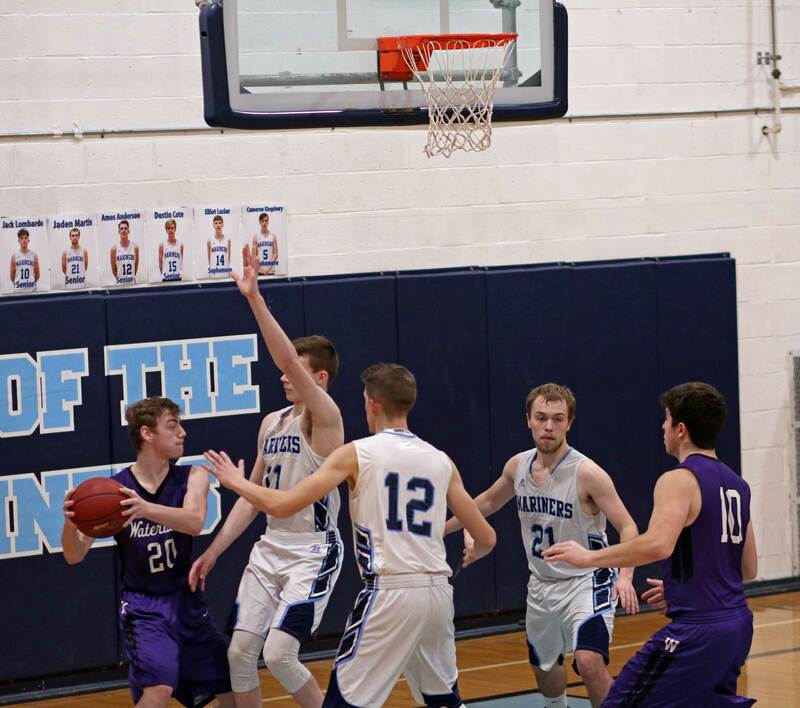 In an earlier meeting at Waterville, the Panthers only lost, 54-46, and despite the unfavorable won/loss record Waterville had lost five game by four points or less. That’s why the quick separation in tonight’s game was a surprise to me. The Mariners’ offense went on a game-long roll, but their defense was equally good. Their man-to-man defense ganged up on the Panther shooters inside and forced nineteen turnovers, including twelve in the breakaway first half. 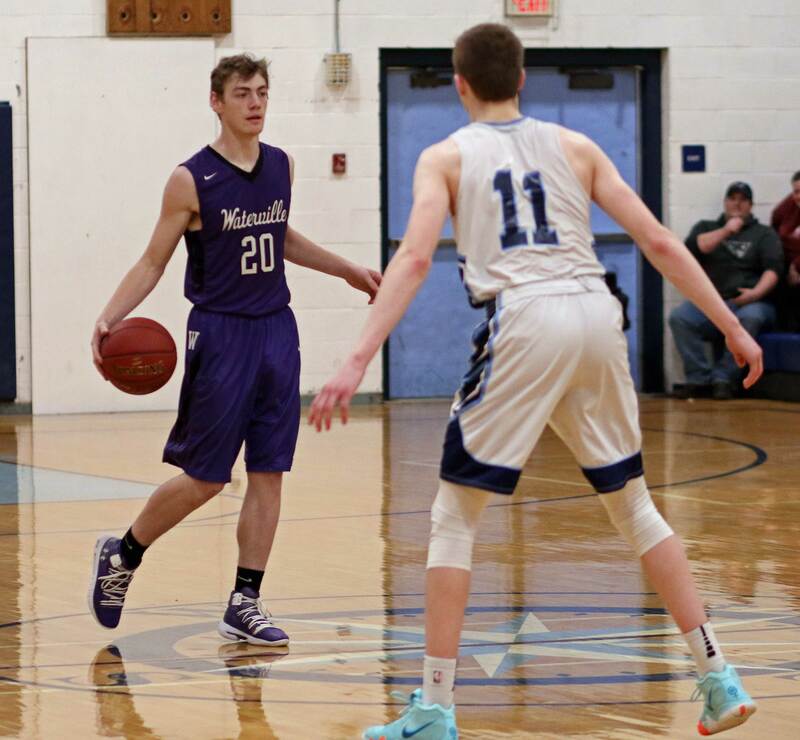 Waterville was within four points (10-6) after a Jack Lloyd layup in the first quarter. Next two minutes? All Oceanside. 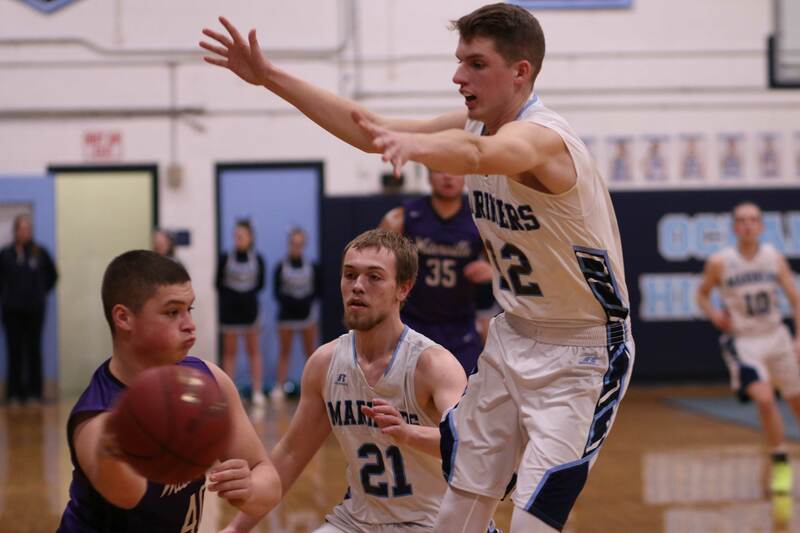 The Mariners had 3’s from Jack Lombardo (14 points) and Cameron Kingsbury (9 points) and four free throws from Cooper Wirkala. Waterville during that same segment? Three turnovers and no points. Off went the Mariners, 20-6, and they never let up. In tonight’s game senior Jaden Martin (9 points) made every three he attempted. 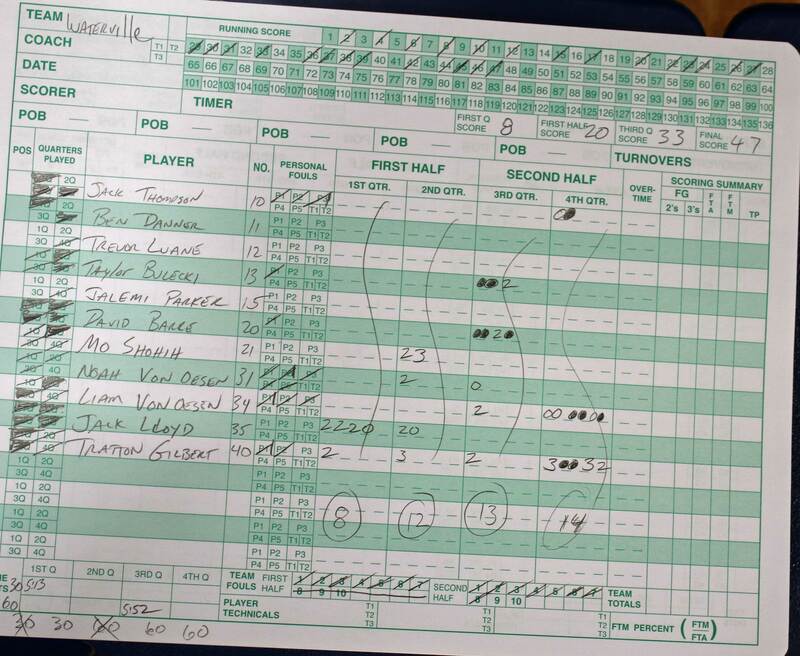 Trafton Gilbert paced Waterville with seventeen points. “When we hit from the outside it spreads the floor and we can make cuts inside and it opens up the whole game for us,” said Cooper. 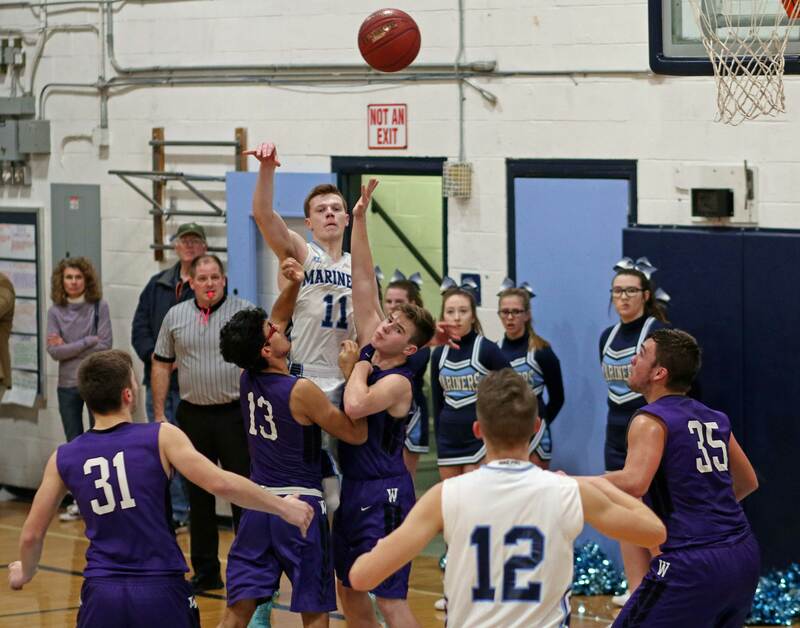 Oceanside’s next game is at Belfast on Tuesday night. Might be a special game for Cooper Wirkala. 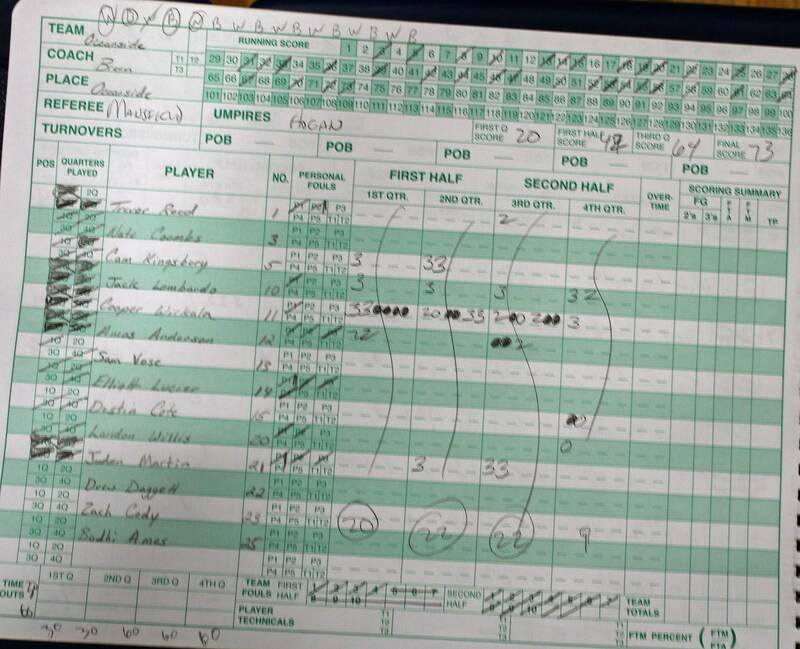 Cooper, after tonight, is sitting with 979 points. A 21-point night for him is certainly not out of the question in Belfast.